Eric Dubois characterizes the art and science of color anaglyphs. 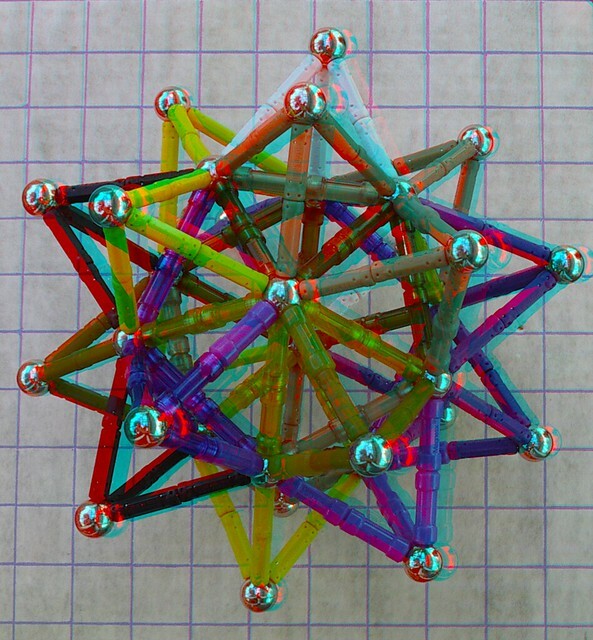 Anaglyph is the name for color filtered 3D images. Anaglyph comes in a few flavors including amber/blue, red/green, red/blue and red/cyan. Red/cyan is the most popular and the one we use on this site. More technical information about it can be found on Wikipedia and other sources. The basic idea is that the two images which make up the stereo view are filtered by these colors so that only one of the two images can be seen by each eye to create the 3D viewing effect. Because color is used to filter the images, accurate color in the image is hard to achieve. For example, with red/cyan glasses reds and blues are hard to show correctly. Red is the most troublesome color to render with red/cyan. The advantage to anaglyph images is they can be shown on any standard screen; no special 3D TV or monitor is required. They can also be printed with standard techniques on any color printer. In addition, the glasses are inexpensive and easy to distribute. These facts keep anaglyph as a serious option for showing 3D today and in the future, especially when doing it in print. 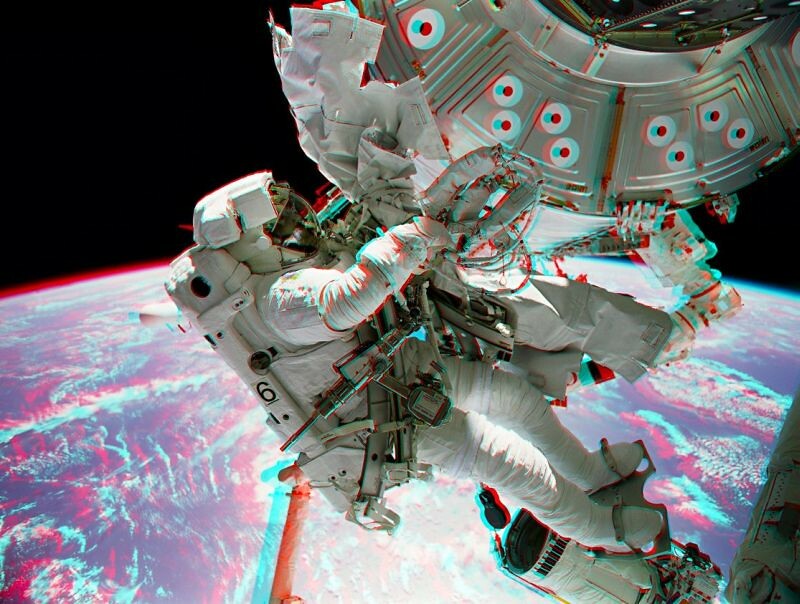 A skilled stereophotographer can plan and prepare for anaglyph to provide a very satisfying result. This can be done manually in programs such as Photoshop or automatically with software made just for 3D. StereoPhoto Maker is one of the best programs for preparing images and it is free and available online here. One of the people who have advanced the potential of anaglyph is Eric Dubois. 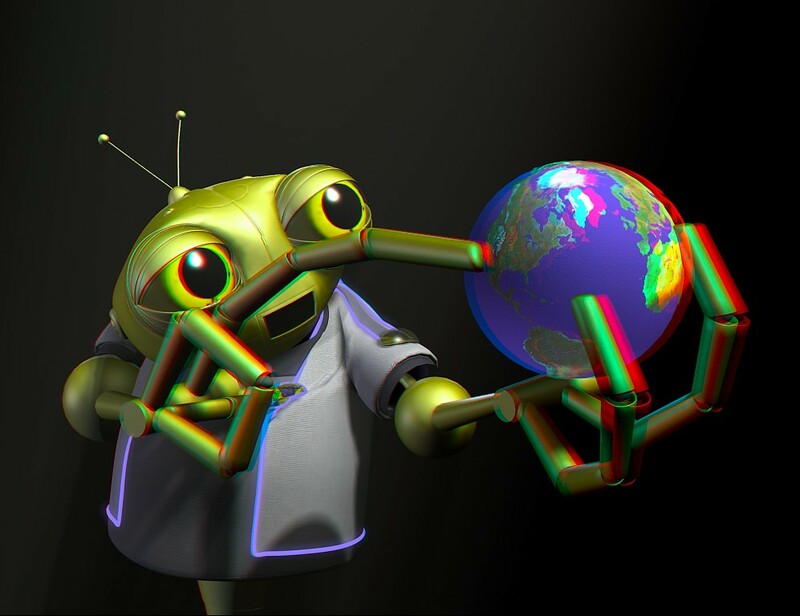 He has created a version of preparing anaglyph images that gives very good results. Info on his work can be found here. 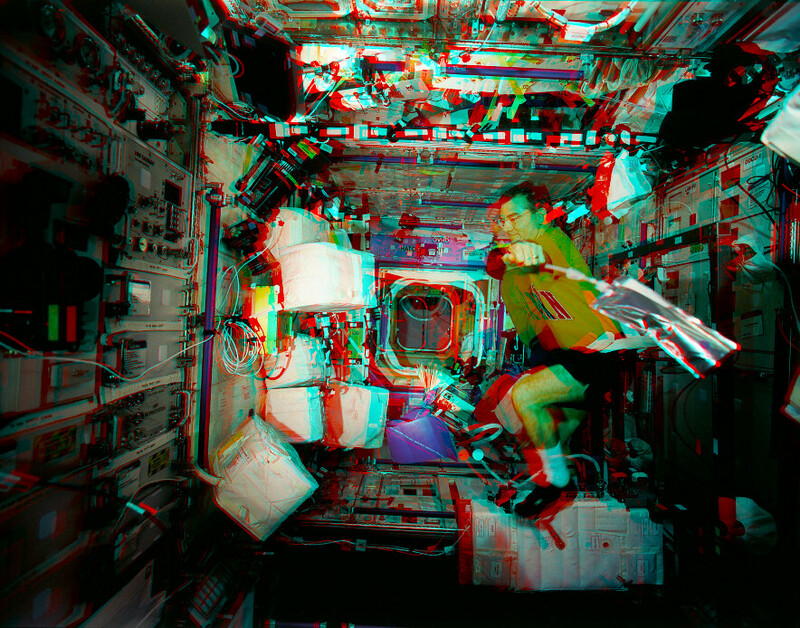 Enjoy Eric’s out-of-this-world anaglyph imagery below. Eric Dubois is an electrical engineer and professor at the School of Information Technology and Engineering at the University of Ottawa in Ottawa, Canada. He became interested in stereoscopic imagery in the late 1990’s when he worked on a research project in collaboration with IMAX. During this project, he attempted to characterize the anaglyph process, taking into account the spectral characteristics of the display devices, the colored filters in the anaglyph glasses, and the cones in the human eye. Based on this characterization, he developed a least-squares algorithm to generate an optimized anaglyph from the stereo pair. 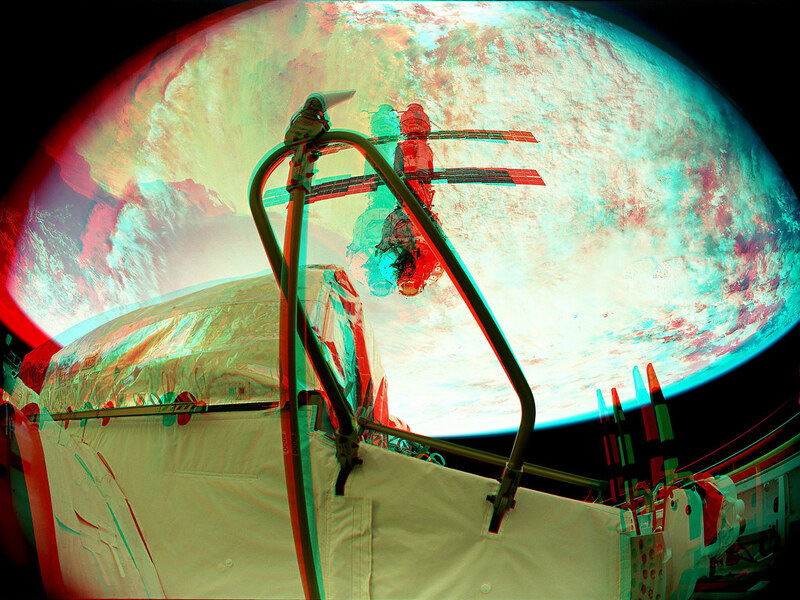 The red-cyan version has been incorporated into many popular stereoscopic viewing programs including StereoPhoto Maker, but the algorithm also works well for green-magenta and amber-blue anaglyphs. He continues to carry out research on stereoscopic imaging, including stereoscopic omnidirectional panoramas, as well as on color image processing. He has done a lot of work on color interpolation for digital cameras and has written a book entitled, “The Structure and Properties of Color Spaces and the Representation of Color Images” published by Morgan and Claypool in Oct. 2009. You can view more of Eric’s anaglyph images on Flickr. Thank you Eric for the great work you’ve done in the field of color anaglyphs. 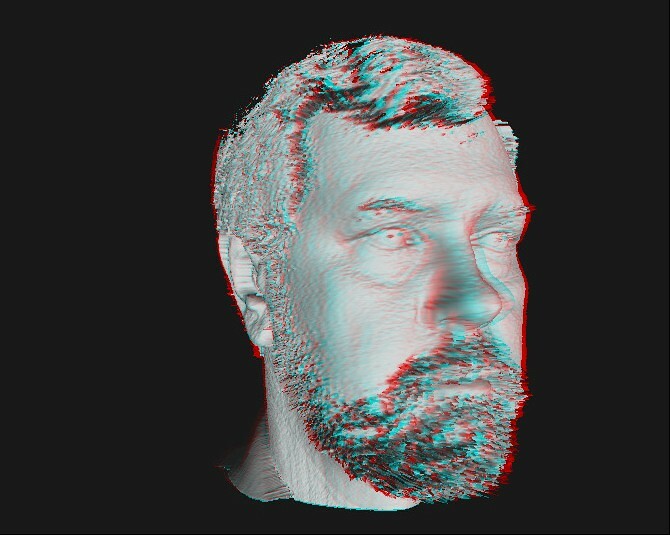 Eric’s work with anaglyph optimization has been enjoyed by almost everyone working in this medium. When you hear someone say they used the Dubois method for their anaglyph – that is Eric. We all owe him quite a bit of thanks. I frequently use the Dubois anaglyph formula in SPM because it does not have retinal rivalry and precious few ghosts. I often try my own menu in SPM, always based on Eric’s method, but although I imagine I improve colour from the rather yellow Dubois result, I cannot challenge the ghost and rivalry results without a lot of messing about. I wish I was smart enough to follow Eric’s maths. Maybe one day he will develop a Dubois part two version with an alternative colour balance? Regrettably RC anaglyphs will never show red and the yellow/ochre versions which do show red have other major problems. For now, Eric’s method rules! Very good article 🙂 I like these explanations.